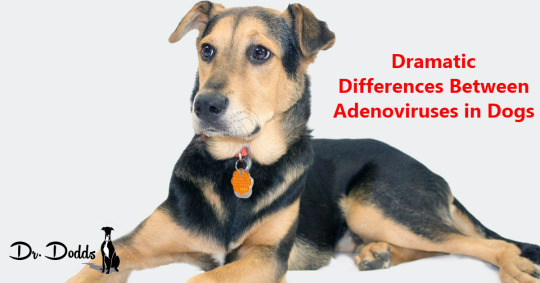 Several strains of adenovirus exist, but two clinically significant adenovirus types have been identified in dogs: adenovirus type 1 (CAV-1) and adenovirus type 2 (CAV-2). Interestingly, these two adenoviruses are spread similarly, but the resulting diseases are vastly different. Both adenoviruses are spread from dog-to-dog interactions through infected respiratory secretions or contact with contaminated feces or urine. High risk exposure areas are considered to be shelters, rescue centers, breeding kennels, pet stores, doggie daycares, dog parks or multi-dog households. CAV-2 is a member of the kennel cough complex – or simply a canine-type cold. Kennel cough is produced when more than one virus, bacteria and other multiple pathogens are combined. Kennel cough usually resolves on its own and serious illness is unusual. Death from kennel cough is extremely rare, unless the animal has other serious concurrent conditions that are immune suppressant (terminal cancer, systemic immune deficiency). On the other hand, various signs of CAV-1 can possibly include fever, abdominal pain, anorexia, thirst, apathy, conjunctivitis, vomiting, elevated blood clotting, convulsions, elevated heart rate and diarrhea. However, CAV-1 causes infectious canine hepatitis (ICH), which has varying degrees of severity, and can cause death. As the liver is the site of most clotting factor synthesis, severe liver disease can result in excessive bleeding. This bleeding can be seen around the teeth, and from mucosal surfaces like the nose and bowel. The mortality rate for clinically expressed ICH is 10-30%. To prevent ICH, veterinarians give a parenteral (injectable) vaccination against CAV-2, which provides cross-protection for CAV-1. When veterinarians gave the CAV-1 vaccines, “blue eye” from formation of antigen-antibody protein complexes in the eye could result; and so this vaccine was taken off the market some years ago. It is scientifically and medically interesting that this vaccinal cross-protection exists for two related viruses that result in quite different symptomatic outcomes. At the current time, I do not recommend routinely giving the CAV-2 vaccination for either ICH or kennel cough. In the United States, there has only been one documented and isolated domesticated dog ICH incident in the past fifteen years. If and when a true outbreak does happen, my vaccination protocol can be revised appropriately to include CAV-2 vaccination for a specific region. Some field biologists may disagree with my current protocol. In a survey of 387 free-roaming gray wolves in Minnesota, 88% of adult wolves and 45% of their puppies had high exposure to both CAV-1 and CAV-2. Yet, we should remember that no unvaccinated domesticated dogs have been reported to have contracted the CAV-1 disease. Another survey of 60 free-roaming raccoons in New York City’s Central Park demonstrated zero seropositivity for adenovirus-1. It should also be noted that the same study showed zero incidence of canine distemper virus from 108 raccoons, but that 54 out of 59 raccoons were seropositive for canine parvovirus. Carstensen, Michelle, et al. “A Serosurvey of Diseases of Free-Ranging Gray Wolves (Canis Lupus) in Minnesota, USA.” Journal of Wildlife Diseases 53.3 (2016): 459-71. BioOne. Web. 23 July 2017. http://www.bioone.org/doi/10.7589/2016-06-140?url_ver=Z39.88-2003&rfr_id=ori:rid:crossref.org&rfr_dat=cr_pub=pubmed&. Creevy, Kate, DVM. “Overview of Infectious Canine Hepatitis.” Merck Veterinary Manual, n.d. Web. 23 July 2017. http://www.merckvetmanual.com/generalized-conditions/infectious-canine-hepatitis/overview-of-infectious-canine-hepatitis.